A Google Cloud Platform project, managed by the Actions Console, gives your project access to the Google Assistant API. The project tracks quota usage and gives you valuable metrics for the requests made from your hardware. To create a new project, type a name in the Project name box and click CREATE PROJECT. 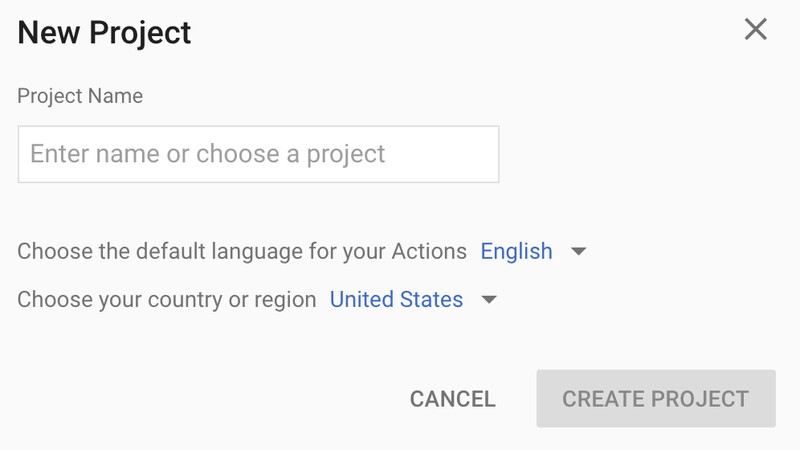 If you already have an existing Google Cloud Platform project, you can select that project and import it instead. If you created a new project, click the Device registration box near the bottom of the page. If you imported a previously-created project, this box will not be displayed; select the Device registration tab (under ADVANCED OPTIONS) from the left navbar. Keep this browser tab open. You will use it to register a device model in a later step. You must configure the OAuth consent screen for your project in the Cloud Platform Console. Note that most fields on this page are optional. In order to use the Google Assistant, you must share certain activity data with Google. The Google Assistant needs this data to function properly; this is not specific to the SDK. Open the Activity Controls page for the Google account that you want to use with the Assistant. You can use any Google account, it does not need to be your developer account. In addition, be sure to select the Include Chrome history and activity from sites, apps, and devices that use Google services checkbox.